GP80UP is a portable LCD projector. Based on Android System, it is powered by Amlogic S905X Quad-core CPU. Comes with 1GB RAM and 8GB ROM, it delivers a rich user experience which runs Apps and games quickly. Adopts LCD technology with more than 30,000 hours of LED lifespan, features 1800 Lumens brightness, 1800:1 contrast ratio design and 800*480 native resolution, supports up to 1920 * 1080 (for a 1080P video-allowing you to watch your favorite movies in high definition). Built-in amplifier-chip and built-in 5W stereo speaker provides Hi-Fi level stereo audio performance and cool home theater experience. Support 28-120 inches image size and 1.2m-5.5m Projection Distance, give you a clear frame and a projection size of up to 120 inches. You can select the optimal size of the image by adjusting the distance to obtain the best user experience. With a lens cover to protect the lens from damages, with a screw hole to install a tripod, with a retractable foot to heighten the front side of the projector, and with more convenient functions for you to explore, it is a wonderful gift for yourself and others. Based on Android System, it is powered by Amlogic S905X Quad-core CPU. Comes with 1GB RAM and 8GB ROM, it delivers a rich user experience which runs Apps and games quickly. 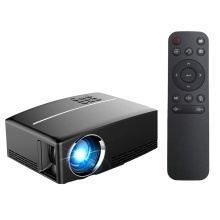 Adopts LCD technology with more than 30,000 hours of LED lifespan, features 1800 Lumens brightness, 1800:1 contrast ratio design and 800*480 native resolution, supports up to 1920 * 1080 (for a 1080P video-allowing you to watch your favorite movies in high definition). Built-in amplifier-chip and built-in 5W stereo speaker provides Hi-Fi level stereo audio performance and cool home theater experience. Support 28-120 inches image size and 1.2m-5.5m Projection Distance, give you a clear frame and a projection size of up to 120 inches. You can select the optimal size of the image by adjusting the distance to obtain the best user experience. With a lens cover to protect the lens from damages, with a screw hole to install a tripod, with a retractable foot to heighten the front side of the projector, and with more convenient functions for you to explore, it is a wonderful gift for yourself and others. OSD Menu Languages: Chinese, English, etc 23 languages. Supports: MKV, WMV, MPG, MPEG, DAT, AVI, ISO, MP4, RM and JPG file formats.